I guess everyone knows mixing some colors up on a CD for example. You take it on the CD, paint about 10 Minutes and your colours went dry - so you got to mix it up again, again and again and the amount of unused color dried rises in horrible heights. One of the main reasons, because i work with a Wet Palette is that this doesn't happen and i can use my colors for days. 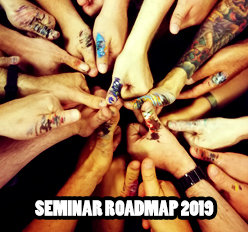 Step by Step - let me explain. 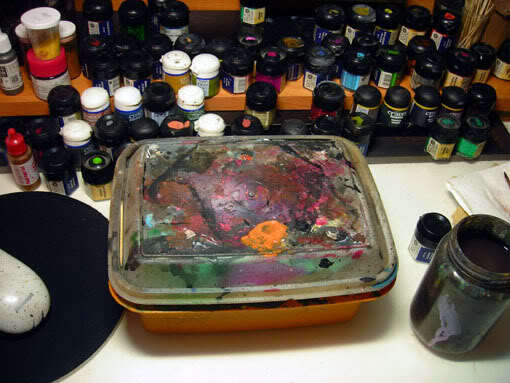 How to build my own Wet Palette? "Parchment paper which is used for cooking is a greaseproof paper. It is a sheet of paper impregnated with silicone, making the paper moisture resistant. You can buy it in Grocery stores." Now get some Baking Paper, but make sure it is one without oily coating - it won't work with that or at least your colours mixed upon will change dramaticly in their properties. Not good, i repeat, not good. Now put the Baking Paper on your tissues. Smooth down the Paper with your fingers, it helps to make your fingers wet before. Perfect would be having not too much water in your wet palette and not to less. The perfect amount is when you can easily move the paper over the tissues without having it blocking while moving. 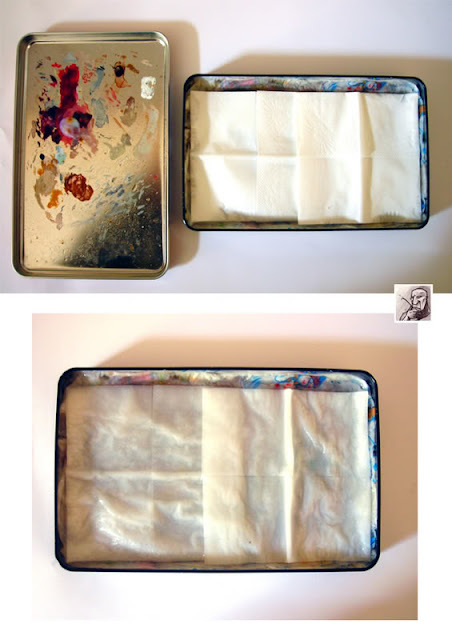 Now you can mix up your colours in there and the very good about it is: Your colours won't dry fast, because the baking paper regains water from the undergrounded tissues for a long time. The baking paper keeps your colours wet (really great while working with glazes). 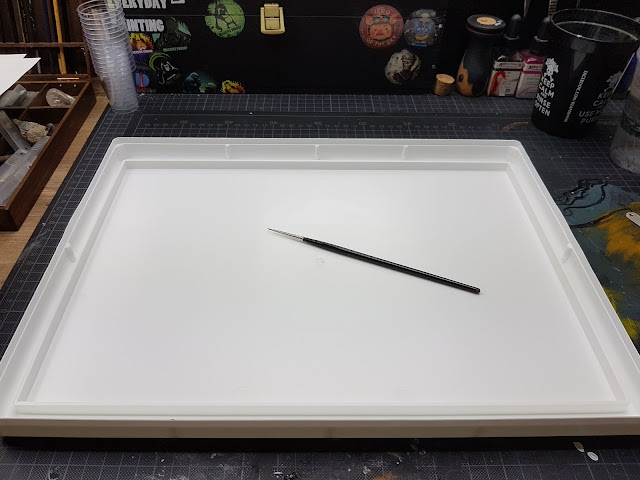 If you want to hold on to it a little longer than one painting session it would be a good idea to use one with cover to close it and save your colors to the next day. BUT take care, at least after one week you should change it and make it fresh, before it stinks and walks away from itself telling you the name of the dark god of Pestilence, haha. I quickly learned to not use a metal box. It is awful when it starts to rust, because of all the water. Lesson learned. Stupid lesson. So plastic ones, kind of tupperware. On this picture above you can see one box out of metal. I changed this to some Tupperware lately because the metal started to rust after about a year or so. Learning and gaining experience from the active doing is all what our beloved hobby is about. Also you can see that i am using the cover for a lot of things. Short color tests, Tips of glue and way more things i don't want to speak about in public. 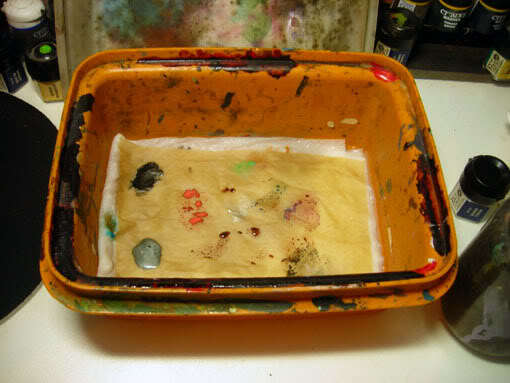 Here is my actual Wet Palette - to clean it i just put it in the Dishwasher - sure it is not getting total clean, but who cares - things being worked with have the right to look like this. 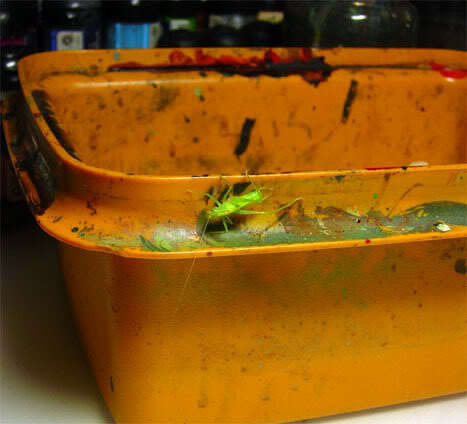 Take good care of keeping your wetpalette clean and fresh once in a while. It can be unhealthy and cause stomach problems if you are a brush licker. I learned that it is great to have one that is not too large in height on its side. It always feels stupid and annoying to "dig" for your paints. Thanks for the tutorial Roman! I've wanted to try the wet palette for some time now, and with this I think I'll jump right into it and give it a go! Thanks again for show us this kind of tips, I'll try it! Thanks a lot for all your great tutorials! Roman, I made myself a wet palette today, following your tutorial, and am truly pleased with the results! I've linked back to your tutorial from my own blog, hope it is okey! Great article! Is baking paper the same as wax-paper? I have been doing a lot more glazing, and painting with watered down paint lately. Great write-up! Gonna try this out tonight. Great info on painting minitures here. Keep up the good work. Parchment paper which is used for cooking is a greaseproof paper. It is a sheet of paper impregnated with silicone, making the paper moisture resistant. You can buy it in Grocery stores. Hi Ater, thanks for the info and the motivational words... i will bring this info about the paper into the article by quoting you, if this is not ok, just let me know... Thanks a lot! ehm ok ich hab hier noch keinen account wollte aber mal fragen mit baking paper meinst du backpapier oder? Is there any special baking paper u suggest? I noticed that mine produces flints other the time. If you're using Butter Bread Paper instead of Baking Paper, the danger of mixing the colors with oil coming from Baking paper is over. In the states Reynolds makes parchment paper. The Reynolds website says it should be available at Walmart and Target as well. I am just curious... have you ever tried adding sodium metabisulfite (sterilizer used in wine making) to prevent your wet palette from souring? did you think about using your visitor's colors as part of a color scheme for a figure?